There’s corn and then there’s Corn With A Kick. Grilled to perfection and given a South American spiciness that will lift the eyebrows on anyone. 1 Evenly rub corn with Flora Gold. Grill corn over medium heat, turning often, until tender. 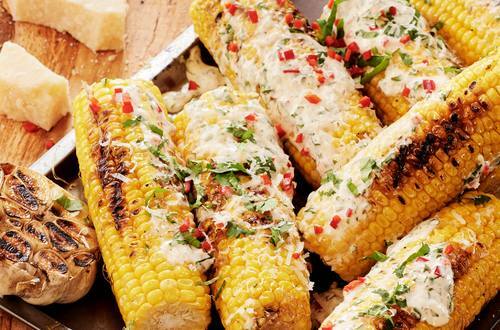 2 Arrange hot corn on serving platter; let cool for 3 minutes. Meanwhile, combine Hellmann’s Real Mayonnaise, lime juice, garlic and chili in a small bowl. 3 Brush corn all over with the mayonnaise mixture. Sprinkle with cheese and garnish with fresh coriander.